Is it really possible to place one of the popular spread trades (bear call spread, bull put spread, etc) and enjoy riskless status, all the while looking forward to a possible super-duper payday? …I’ll show you how all the cool kids are doing it. Check out this quickie SlideShare and get all the details, updated September 16, 2016. I predict that a bear call spread executed on August 31 will collect $100 but NOT risk any capital of itself… the trick is in the context of the trade. Didja view it? LOVED it? Shared it maybe? Okay, back to the post. Enjoy! What’s the Problem With Doing Spread Trades? Spread trades are a WONDERFUL way of grabbing quick cash from the market… that is, except when they end up being just a quick a way to lose it. Now, I own a martial arts studio (no joke). When a 20-something, 225-pound former high school football player signs up for Mixed Martial Arts (MMA) classes… I get to toss him around my dojo like a kitten with a ball of yarn. The reason I have such a fun time whipping snotnosed kids is because of my training in jiu-jitsu: the Japanese science of leverage. But fast forward 12 months and I’LL be dodging young snotnose. Why? Because he now understands some of the leverage principles , AND he’s a big ‘un. Why the analogy? Because I’m describing you, Trader..! You might be able to beat the market sometimes with your leveraged trades. But sooner or later the 225 pound punk gorilla called THE MARKET will catch up with you. Spread trading courses and programs are common as dandelions in the suburbs. So is the sob story of the victims students of these courses. It’s hard to swing a dead cat without hitting a spread trading fan that got the sh!t kicked out of ‘em by the market’s mercurial swings. Beware: Leverage is a two-edged sword. Why Haven’t the Problems with Spread Trades Been Solved? In another series of posts about trading, we handled the issue of position sizing. The biggest, most important consideration in trading ANY issue is position sizing. It’s been argued by the world’s top traders that position sizing is the most vital factor in trading success. But it’s not the only factor. Let’s take the instance of your leveraged trade, a bear call spread that can grab a FAST $100, and do it two times out of three. See that? Now of course, I’m exaggerating some by putting the loss potential at 100%, but you get the picture. Theoretically, your risk is indeed 100%. Now, by inserting a position size of 10%… miracles start to happen. The problem is NOT solved though, not by a stretch. Because with a just a tiny aberration of 5% to your success rate… now you’re looking at a loss again. How Can Your Spread Trade be Made RISKLESS? Rather than doing your spread “bare”, you simply add a context to your spread trade that makes it riskless. It’s easier to get your head around this than you might think. The “naked call” is as risky a play as you can do. In fact, the only play that’s more risky than a naked call… is TWO naked calls. This is because if you’re short a call, and the stock goes up… you’re on the hook to deliver stock at a low price, but buy it at whatever the market price is. …then, the risk of selling the call is null and void. That premium is captured no matter what. Sure, you still have whatever risk is presented by owning the stock itself… but the short call is riskless. You get to keep the premium, no matter whether your underlying stock goes up, down, or sideways. So How Do You Make a Spread Trade Riskless? First, let’s consider a common spread trade play: the near-expiring bear call spread. Its risk is finite and so is its potential payout. Now for the context… rather than using stock alone, let’s use stock plus a far away expiry put option. By itself, the married put risks $200. And, by itself, the bear call spread risks $150. Does the TOTAL risk of doing both plays equal $200 + $150 = $350? The total risk of both plays is actually reduced. The total AT RISK amount for both plays is only $100… less than either play by itself has! The bear call spread technically riskless; the only way that the bear call spread can close against you is if your married put gains enough to pay for any loss. I just showed you a RISKLESS bear call spread. In the real example I’m showing today, $100 is captured by the bear call spread. We call this Income Method #6 because out of the TWELVE “Income Methods”, #6 was the sixth technique we proved with real money in real time. Click me! <== to get this entire blog post as a PDF. 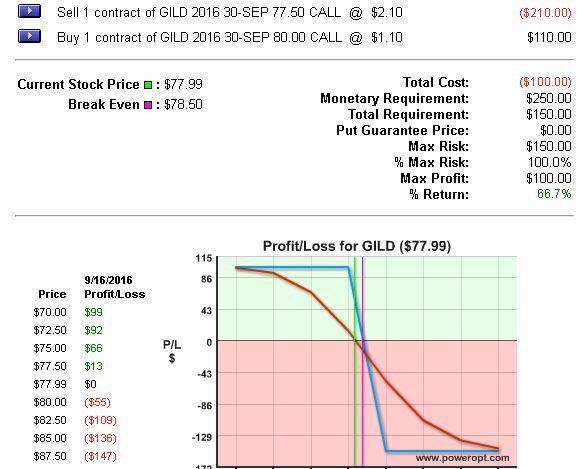 …was reduced to $100 risk by capturing $100 from a near term bear call spread. If the stock goes up, we make money. 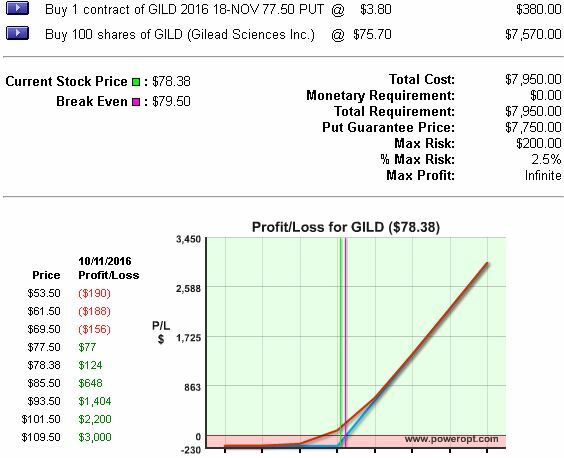 But what if GILD stays put or goes down? Well… the $100 captured goes against the cost basis of the married put. …and if the second bear call spread captures $100 again, well now the Context Trade of the married put is bulletproof. And there are still weeks and months before expiration. You’re in a pretty position. Heads you win, tails you can’t lose. What Should You Do Next to Make YOUR Spread Trades Riskless? …and see how to structure SEVEN riskless spread trades. 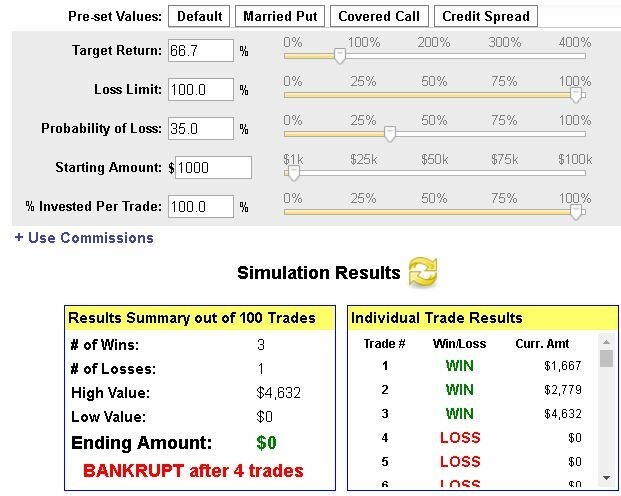 In two minutes you can be learning how to eliminate all risk from your spread trades, and indeed perhaps your stock trades as well. Okay Traders! Enjoy the post. See you in the next one. I have just sent my order for Blueprint Home Study Kit. Anyway, I don’t quite get it regarding protection of married put (long stock with put protection). Let’s assume that price of stock is 78.38 as in example above on expiration day. The $80 strike price long call would expire worthless. But I am still liable to sell my stock when my stock gets called away at $75.50 via the Short Call. That would expose my put which is out of the money as well as my Stock gets called away! With the above (my Married put with Long stock combo setup is broken) and I cannot repeat my Income generation in the following months! Haha what you are missing is The Blueprint! Not to worry PM, you have it on order. Suffice it to say that there are a number of management techniques to employ as expiration approaches, or even AT expiry. So what happens is your stock gets called away at $77.50, yes? And your cost basis for the stock had been $75.70, so that gives you a $1.80 profit on the stock only. 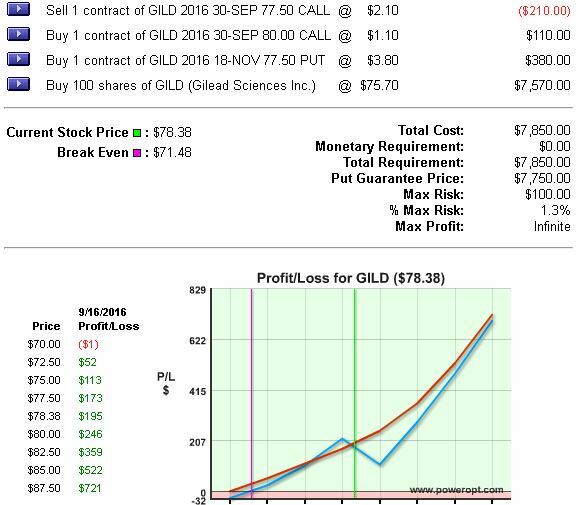 Also, you generated $1.00 by doing the bear call spread, and that premium is something you get to keep. So far we’re up $1.80 + $1.00 = $2.80. That $2.80 that’s been collected is suspiciously close… well, shoot it’s IDENTICAL… to the $2.80 we spent for the November $77.50 put. So NOW… we do still have the put option that’s wasting away as time goes by… but, hey. It’s worth SOMETHING. You can cash it now and be out of this trade with a profit. How about in the closing minutes of the bear call’s expiration, you buy 100 shares at $78.38. The first 100 shares are getting called away, but you want another 100 shares to replace them. Then you’ll be sitting on stock at a cost basis of $78.38… AND a November $77.50 put option with NO cost basis (you collected the $2.80 that it cost by selling stock and collecting premium on the spread, remember? )… so $78.38, $77.50 of which is guaranteed. So only .88 cents can possibly be lost. At this point you might get a pretty penny for doing an Oct 7 $77.50/$80.00 spread. Probably more than the .88 cents that are AT RISK. For argument’s sake let’s say it’s $1.00 credit to offset the .88 risk. 1) is less than $77.50, you KEEP the dollar premium and can go again. So again, you’ll be in a bulletproof situation. Thanks for picking up The Blueprint PM! Be sure to use your support, and consider a Fusion or PowerOpt subscription too. I purchased the Blueprint on order, and I have 3 married puts on div paying stocks, each with 2-3% max risk, which is good, and with breakeven on date of purchase of about 6-9% above stock purchase price (ie, stock plus put price divided by stock price on purchase). Puts expire in Jan/Feb 2017. The stocks are down about 1-2% since purchase. Currently, the Blueprint-approved spread net credits are only about 10 cents, so difficult to do now. Questions: with stocks down slightly but within the original max loss, are there any income methods I can do now to move the positions toward bulletproofing and equally importantly, get closer to my breakeven so I can eventually make money on these? If nothing now, what income methods should I be looking to do during time until put expiration in Jan/Feb 2017, assuming that the stocks remain down slightly during the entire period, to get me closer to bulletproofing / breakeven? Or do I have to prepare myself to just accept that stocks which do not move up after purchase, and stay at a loss throughout the put term, are just destined to be losing positions, although within the limited risk provided by married put? If there are IMs to handle losing positions, what are they and when is the right time to do them? Soon after establishing the positions or wait a while? Now, these questions are GREAT… but it’s not appropriate for us to go into depth in this forum with the answers. Please write support at radioactivetrading dot com and include the symbols you’re trading, the costs bases, and cost bases of the put options. I look forward to reading your email and talking with you at support. Happy Trading! Appreciate the details. I need sometime to digest the information and get my head wrapped around this – but I get your point. It appears in all the examples, at least for those that I have seen in your Youtube and webinars, you have used examples of stock going up after purchase of the married put setup (ITM Put combined with Long Stock) and limiting to single digit loss as catastrophic insurance by using the said Put. However, let’s say the Stock either (a): stays in a tight range Or (b): drift lower and lower immediately after the purchase of the married put – would any of the income strategies work? It would be great if you focus on such scenarios such as (a) and (b) above in your Blogs, Webinars and Youtube Videos. There is a 2/3 chance of this happening out of 3 possible situations (stock being in a tight range-bound, go down, go up), your solutions would therefore be useful to a lot more folks. I reckon that If the stock is going down, the covered call option would be an unsafe approach to generate Income. Just imagine buying a Stock at $50 and being forced to sell it at S30 at the Short Call Strike Price; I hope I have not confused anyone. I am wondering how we handle such a situation; how do we generate income and still keep the Married-Stock Option Setup intact? You’ve hit the nail on the head regarding the covered call… people with that “one track pony” mindset are destined for disappointment. The Blueprint has TWELVE adjustments, to address all market conditions. Now to answer the first part of your comment/question: the reason you’ve gotten The Blueprint is to correct the problem of devastating losses, or a small loss becoming a large one. The RPM setup itself addresses that possibility. 3) BULLETPROOF it and reset the clock. In the case of a sideways-trending or slow down trending stock like you described… Income Methods #5, #6, or #8a will likely counter the loss of time premium lost. The MOST important thing you should get from The Blueprint is a sense of hope. If you follow directions you will never lose more than single-digit percents again… and will position yourself for those fortunate double-digit gains when they come. I agree with mr. Kumaar. I just started at Fusion and at the moment 5 of my 6 RPM-positions are at a loss. O.k. I sleep well at night but the married puts are not yet profit machines. In my opinon there could be a bit more focus on how to handle stock that is down after positioning the RPM. I’m happy for your sleeping well. But thanks for your input about stocks that go down after initiating the RPM. n this market I’m PERSONALLY limiting the hold time of RPMs to 30 days, while using sideways Income Methods to capture time premium. Would you be happy to send your RPMs to support at radioactivetrading dot com for a second set of eyes? I’m pretty busy but can spare a minute. Make sure that Mike or Greg forwards the email. If the stock goes down, it the strategy to sell the put and buy another one at a slightly lower strike, still above the new overall cost? That is a play that we’ve documented… we call it Income Method #9. IM#9 has been used to recover capital but it does put more capital AT RISK so I use it sparingly. One of my pupils was able to ride OfficeMax from about $20 a share to about $5 a share and PROFIT with it… this during the 2008 crash. There are other ways to recover capital of course, OR simply take the teeeeeny loss. Remember that the whole reason to use a married put in the first place is as an insurance policy if the stock DIDN’T perform as expected. Then we have most of our marbles left, as we go seek another game. hi Kurt, I’m a big fan of yours (well, actually I’m 5’6″ myself) but I wanted to ask with the RAT and to be bulletproof..if i have a small account of like $5,000.00 I can’t really do these married puts and use your Blueprint too often as I can’t afford to buy many stocks at 100 shares at a time. Do you have any suggestions? Thanks in advance and hope all is well with you and your family. Awww, ye do flatter me good sir. 3) consider a variant of Income Method #12 that requires ownership of only 50 shares. If you already own The Blueprint I can hook you up with that knowledge, yo. I’d like the example of the riskless trade. WOW!!! Really terrific strategies. Thank you. I think YOU are terrific! Thanks for reading and commenting. When you get the slideshare, be sure to pass it along to someone that can use these strategies too. Radioactive Trading has opened an entire new world for my investing. The education received has paid for itself many times over. Glad to have you on board. Check in anytime, and look for those slides to share. Hi Kurt, been following you for some time and as always you provide great examples and answers. Ha ha HOWDY Saki. Enjoy the slides, it won’t be long. I think you might have said howdy already. No worries; your slideshare is on the way! Need more time to fully understand. Thanks. Love to share ’em with ya! The basic principle is revealed in the slideshare. The SEVEN riskless trades are in a video called, “Stop Losing at Spread Trades FOREVER!” and you can grab it at this link. Now, I should mention two things. 2) Consistently taking positions like this WILL sometimes result in a runaway winner… and the best news is that your upside is unlimited (not like in a covered call situation where your winnings are capped)! Thanks Les! Be sure to view, then comment, then SHARE if you think the info is worthy. Howdy; thanks in advance for sending me the slide show. Bet on it Garlan! It’s on the way soon. Thanks Ronald! More where that came from 😉 See you soon, and please share the slides. Howdy yerself Orrin! Look for that slideshare soon; you’ll be intrigued how simple it is to execute a riskless spread trade. On the way Keith! Glad you liked it; the best is yet to come. 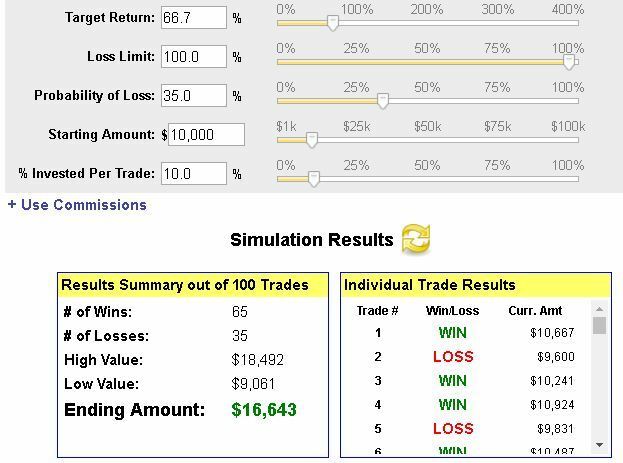 This is quite interesting and should keep folks from losing a lot in a trade as well as making money with little risk. Please share and comment on the slideshare when it comes. See you then! That slideshow will be helpful. But I can briefly handle the question! It’s kind of a darling situation. Please look carefully at the slides, and if you have more questions go ahead and hit me here on this blog post. Have a question.i like to trade credit spread,i search in software but it is very dificult to find a trade that can be filled because it shows mid price between bid and ask,can it be mofificated? or this is a fix setup of your software. I’m not a software designer. 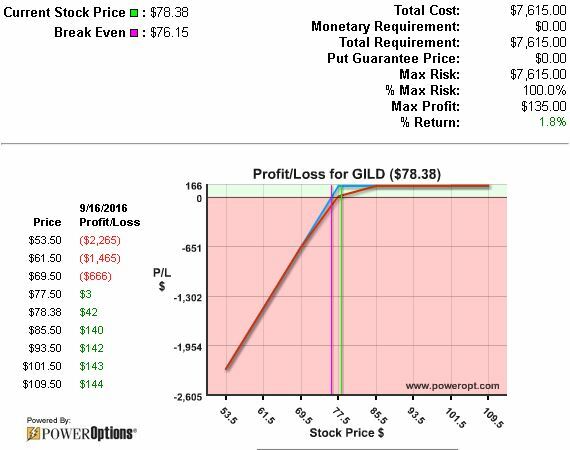 My preferred solution for options trading platform is Power Options. Full disclosure: Power Financial Group is my publisher. But I used their platform as a customer for YEARS before we became better acquainted and affiliated. I can’t give a better recommendation. In answer to your question, let me suggest you call Mike Chupka or one of the Zerenners, Greg and Ernie. James, I started trading RadioActively in 2002 with only $2500 capital. So, YES! It would have been better to start sooner with RadioActive principles, because it would take more than a dozen consecutive really bad picks to lose that much. Get The Blueprint! And look for that slideshare soon. Riskless trades seem too good to be true! Why doesn’t everyone do them? I’ll have to learn more about them. Is there any reason NOT to use them all the time? 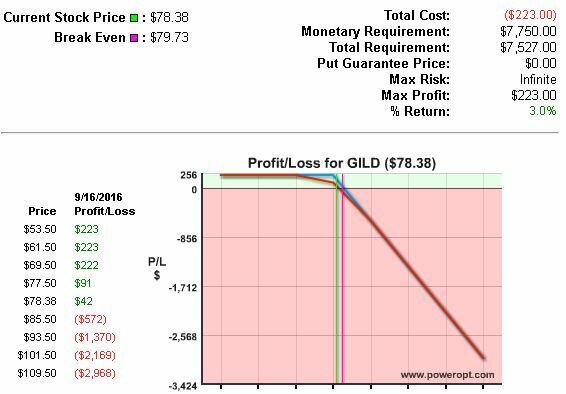 I was bulletproof because of some prior riskless spreads… and then was sitting on 100 shares when BOOM! Disney acquires Marvel for 4.1 billion. NINE zeroes… well, anyhoo I made 30.2% on a stock that could no longer lose. But playing a spread at the MOMENT that announcement was made would have muddied the waters a bit. Thanks for asking. More is handled about that subject in my premium video, “Stop Losing at Credit Spreads FOREVER” if ya want to take a look at it. Glad if ya like it! Check in a few days and we’ll have that slideshare cookin’. Look for the slideshare soon. Thanks for checkin in Charles! Howdy Kurt! I’m a BluePrint owner and would love to have the slide show too! Thanks! Howdy Kurt..I own blueprint and would love to see the slides. Well how do, ma’am? 😉 Thanks for pinging me and especially for getting The Blueprint. Slides a-comin’! Cool Richard! Always happy to hear from good-lookin’ Blueprint owners 😉 Look for the slides toot sweet! What you do is very interesting, I like it. Thanks Michel! I think it’s interesting too. 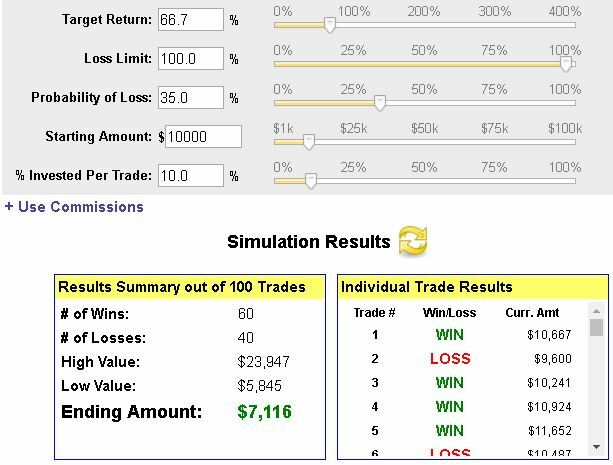 But the REAL test will be whether you can execute a trade like I describe in the slides. Look for them soon! You betcha. Look for that slideshare soon. I’m awaiting Blueprint (should get it within the next couple of days). 1. Assume Apple Stock is $100 (in Early Aug 2016). In the meanwhile, I hope to earn $5 thru some income methods – to bulletproof Investment. And hopefully do some more “riskless spread trades”. But until I close out the ENTIRE Trade Setup of Married Put and Stock (regardless whether I bulletproof or Not), I can Never Sell or otherwise lose the Stock that I originally purchased at $100. Right? The Only Time, I can safely sell the stock I originally purchased would be at $155 (the price at which the entire Premium Cost is recovered). Am I right? Or, am I missing something? Basically my question is this; when can I safely afford to sell the Stock – without losing more than $5? If I sell the stock (or stock gets called away via a spread trade, etc) at $110 and 2 days later the stock shoots to $130. I’m screwed – right? Because now Stock is a lot more expensive to buy back (I have lost an additional $20 if I choose to purchase the stock at $130 and sell it back at $150 Put Strike price on/or anytime before Expiration day). And is it possible to do riskless trades at ANY stock price range between (Let’s say $1 to $90 range – after I recovered the $5 – thru some “‘safe” income methods and have already bullet proofed the Investment? Hey man! Thanks for writing again. Sooo… you shouldn’t go that deep in the money. It’s just not likely that the Income Methods and the trade itself will work out. YES, you have low risk dollar-wise… but there are other factors. Fortunately you can have a better picture soon as your Blueprint is on its way. I can offer you better support and exact answers for all of your queries at the support email address, support at radioactivetrading dot com. Hey James! Long time. I left you a message some time ago but haven’t heard back. Hope things are doing well for you. Look for your slides Monday latest. Talk soon! Enjoy the slideshare here in a few days. I think it’s really slick. Howdy Pardner! Hoping for some discourse when you can. For now, keep your eyes peeled for that slideshow! I was hoping for a little more conversation… but as the King says a little less conversation and more action 😉 Watch for my slide show soon soon soon! Is there a way to do a bull put spread risklessly? Yes! I won’t be covering that particular play in the free slideshow, but the Bull Put Spread IS covered in the “Stop Losing at Spread Trades Forever!” video. Haha not so smart, just a guy that’s dedicated the ol’ “ten thousand hours” thing. I hope you enjoy the slides, they are on the way! my bad…I see it now. SORRY. YOU DA MAN, KURT!!! I own the Blueprint. I use it to trade stocks and options to supplement my retirement income. I would really appreciate it if you could send me a copy of the slideshow on riskless spreads as it will help me understand more your trading ideas. Nothing to matter but thank you to give me possibility to ask any question ! How to maintain 70 to 80% of the gain of a naked call without using a stop order on the option? Curt, I don’t understand your return analysis. The question I have is what type of monthly or annual returns you make using this method. The other thing I would ask is why not just use a stop? I realize that they can be run, but not every time. Same with credit spreads. Why not just set a 15% stop loss on a credit spread? The worst case is that the market makers blow through your stop and you lose the entire amount of the spread. Well trading is risky in general. So I don’t think it is possible to trade anything with 0% risk at all.